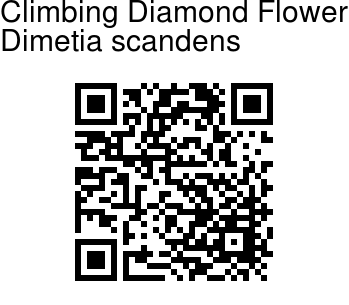 Climbing Diamond Flower is a climbing herb, branchlets 4-angled. Leaves are simple, opposite decussate; stipules flat with 2-cusps; leaf-stalks about 0.3-0.6 cm long, blade about 4-11 x 0.5-4.5 cm, oblong-lanceshaped to elliptic-lanceshaped or linear, pointed or tapering at base, tapering at tip, entire, pale-green underneath; secondary nerves 5-7 pairs, rising up. 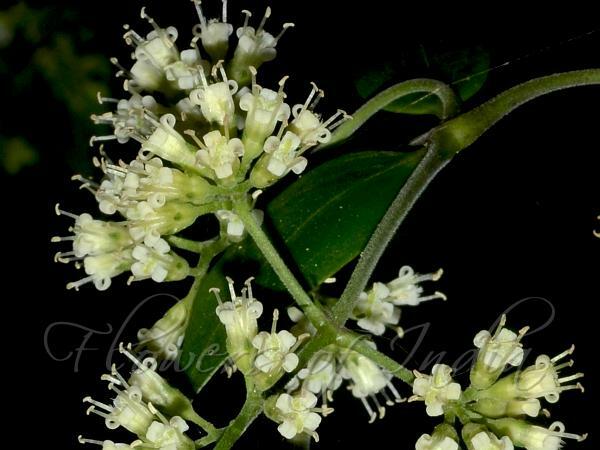 Flowers are about 6 mm across in leaf-axils or at branch-ends, in panicles of cymes, white; bracts subulate, about 0.3 cm. Flower-stalks are about 2 mm long; calyx-tube obconic, about 1.5 mm; sepals triangular, about 0.1 cm. Petals are oblong, about 4 x 1 mm, pointed, truned back. Stamen filaments are about 4 mm long; styles velvet-hairy at far end. Capsules are about 3 mm in diameter, spherical. Climbing Diamond Flower is found in the Himalayas, from Nepal to Bhutan, Khasia, Burma, Indo-China, at altitudes of 400-1800 m. Flowering: July-September. Identification credit: M. Sawmliana Photographed in Reiek area, Mizoram.